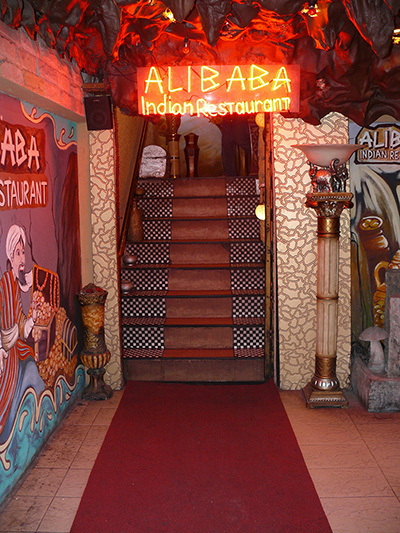 Ali Baba and the 40 thieves’ cave are landmarks in Pattaya, being a very well established Indian restaurant. The entrance to this particular Ali Baba’s ‘cave’ is up a narrow staircase lined with faux jewels purloined by the legendary robbers. Mention “Open Sesame” and you are in another world of make-believe by the time you get to the top. Say the magic words “Open Sesame” as you enter Ali Baba’s cave. The dining floor is made up of alcoves everywhere, seating between two and eight, and the alcoves are well spaced, so you feel you are dining with your friends at your table, not with the entire restaurant. There are also private dining areas, seating up to a dozen diners. The ambience really is very Indian with curtained windows, Indian paintings and tapestry brocades everywhere. 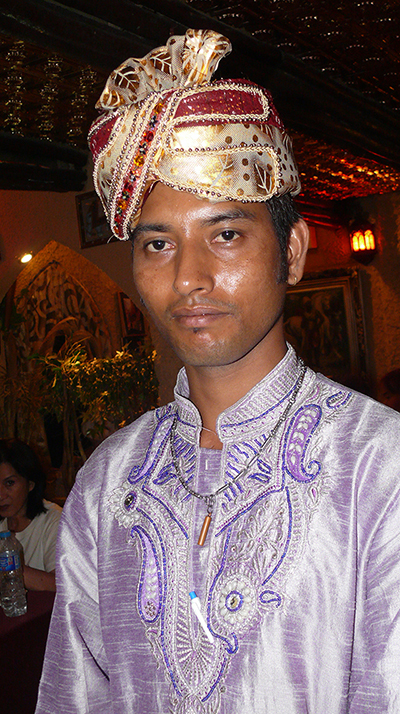 Staff are in traditional garb and are happy to explain the menu to those not quite au fait with Indian cuisine, and the background music is very Indian – you expect 50 dancers to appear at any minute. The menu is large (physically as well as number of dishes) and take your time to go through it all. With wine by the bottle all around B. 1,000, they are not expensive and the Chilean Porta range is eminently drinkable. There is an explanation of differing styles of Indian cooking on the front cover inside, and Ali Baba is predominantly Mughalai cuisine. Starters are mainly around B. 120 including Onion Bhaji and vegetable samosas. Kebabs feature next (B. 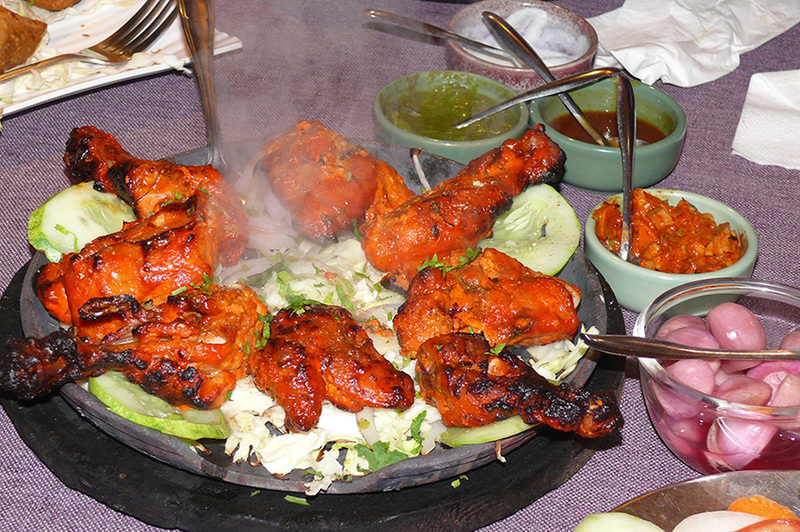 345) and includes chicken, paneers and a Murgh Malai (BBQ chicken). Staff in traditional costumes and ornamental turbans complete the picture. The tandoori cook is a busy chap with almost every table asking for at least one item from the tandoor, including the naan breads (garlic naan is B. 90), and we also tried the potato naan which was very enjoyable. Masala’s are around B. 300 and the ever popular Chicken Tikka Tawa Masala was B. 255. Curried chicken dishes range between B.195-290 and the British favorite of a Balti Chicken Madras is B. 245. Seafood dishes are around B. 350-390, seafood always attracting a premium at the markets and then at the end user. Lamb is surprisingly cheap, with most at B. 345 including Vindaloo and another perennial Rogan Josh. Still in the menu, the paneers are under B. 300 and the eight different types of rice range between B. 60-310. Breads? There are 17 to choose from, including my favorite garlic naan, mentioned previously. Tandoori Chicken simmering on the hot plate. On the back cover are the two Thali plates. These I recommend to anyone unsure of Indian food and what to order. These are like small “sampler” dishes to see just what you liked most. The vegetarian Thali is B. 590 and the non-veg Masaharithali is B. 675, and is more than enough for one. Indian food lends itself to groups eating and enjoying both the food and each other’s company, and our review evening was a fine example. There were six of us and we shared everything. 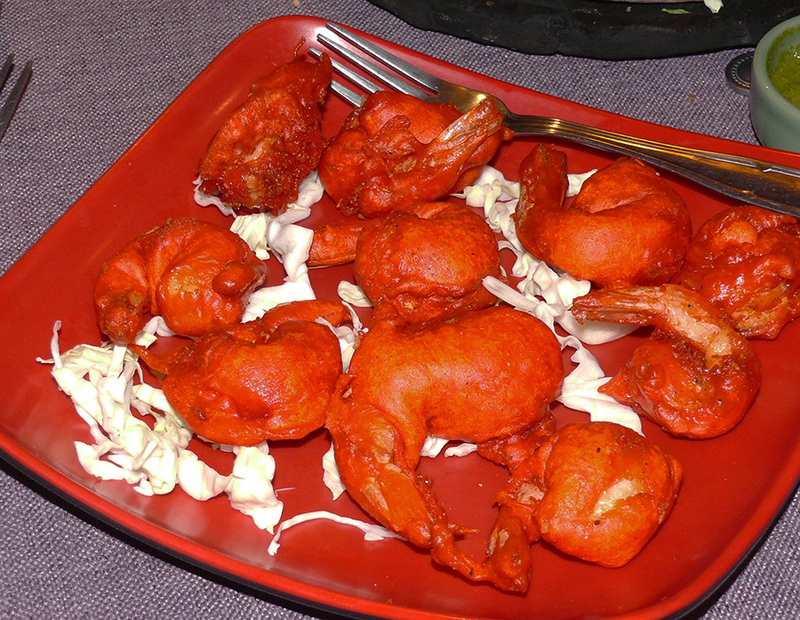 One dish that was universally popular was the butter fried prawns, coated in a bright red batter casing. No spices, just prawns. 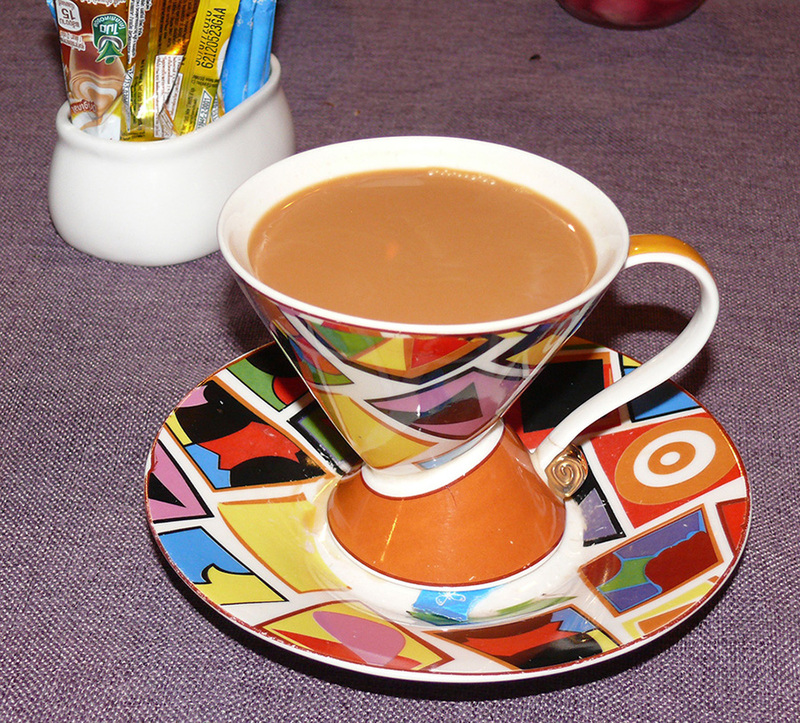 The exotic Masala Chai brewed with a mixture of aromatic Indian spices and herbs, served in a Clarice Cliff cup and saucer. At the end, two of our group asked for Indian tea and they came in a faux Clarice Cliff cup and saucer set, just begging to be photographed. It was also significant that many tables were being taken by ethnic Indian groups. They knew where to find their style of food, and now, so do you! Highly recommended. By the way, there is a special offer on at present where every two diners can receive a free carafe of wine. The bright red Butter Fried Prawns. Ali Baba Tandoori and Curry Restaurant, 1/13-14 Central Pattaya Road, Pattaya City, telephone 038 361 620 or 038 429 626, fax 038 414 464, open seven days 11 a.m. till 11 p.m. On-street parking.